My son hooked this decent size sheepshead in New Brighton, Pennsylvania. This isn't his biggest fish. He has hooked and landed may fish this size. As usual he was reeling in his line when the fish took the bait. He struggled for a couple minutes until he finally landed it and drug it on the shore. Up to this point nothing out of the norm. Normally he would push the fish back in and/or grab the tail and drag it to the water. This time however, I turned to grab my cell phone to take a picture, and when I turned around he was holding the fish as you see in the picture. 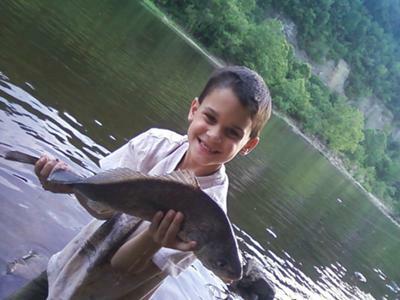 Apparently he was not scared and just heaved the fish up for a picture,... and the smile is priceless!